If you have flat feet you may want to see what your x-ray would look like. 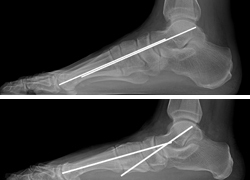 Here is a typical x-ray of a person with a flat foot and a normal foot. You can see a few lines that are drawn on the x-ray to show some measurements. The two lines that area parallel are on the normal foot and the two crossed lines are on the flat foot. However, the easiest area to look at is the heel position. Do you see how the heel is flat to the ground and not elevated upward as a normal foot would look. 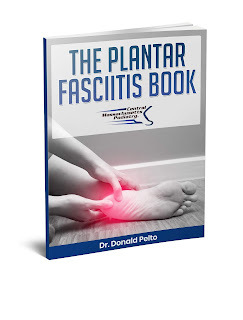 If you would like to learn more about flat feet and kids here is a video I put together.